What is left after the conspiracy theories are set aside. We know the principles that the SSPX follows, how it understands the crisis of the Church and how it applies those principles. 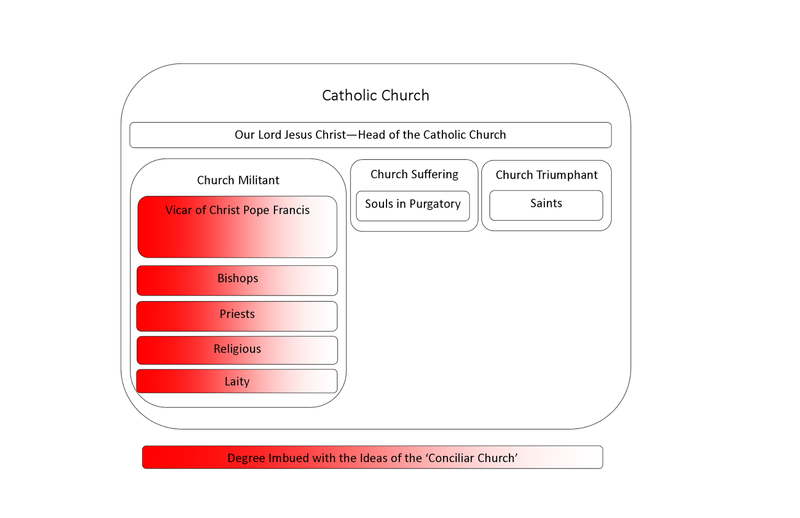 Case in point - the concept of the 'conciliar Church'. Is it simply a movement within the Catholic Church or is it something wholly separate - with the Pope being the head of two churches at once - as the Dominicans of Avrille believe? That the SSPX has not changed on this point is fact. How about the Dominicans of Avrille? Did they ever hold the same understanding of the SSPX in this matter? See Note 1 at the bottom of this post. I wonder what else has changed? Bishop Williamson 2015:not only should the Society not be talking to the Conciliar officials, it should, while observing all charity and respect, be fleeing them like the plague, for fear of itself being infected by their dangerously infectious Conciliar errors, unless and until, exactly as Archbishop Lefebvre said, they show that they are quitting their Conciliarism and coming back to true Catholic doctrine. Are these two people really the same? They are the same person, but a changed person. The Old Bishop Williamson labelled the following as a sedevacantist perspective. Present Church Superiors have virtually forfeited their right to be respected even as superiors by Catholics. Now that's a bit ironic. What about the Valtorta writings? In Eleison 275 Bishop Williamson recommends that the Poem of the Man-God should be read to young children. He defends his departure from Archbishop Lefebvre's line on this literary work of fiction by saying that, wait for it, the condemnation was the work of modernists who infiltrated the Holy Office. "... But firstly, how could the modernists have taken over Rome in the 1960’s, as they did, had they not already been well established within Rome in the 1950’s ? ..."
So he invokes a conspiracy theory in order to promote a book that was on the index of forbidden books for good reason. I wonder what else he has imagined? Most readers will know that I have compiled a list of principles ( Steadying Principles ) that I discerned that the SSPX were using as guides in their relations with Rome. The principle of obedience is why they set aside the principle of 'no canonical regularization without a doctrinal agreement' - because they thought the Pope was ready to accept as as we are (quoting Archbishop Lefebvre). Obedience is still a Catholic Principle and one that St. Thomas Aquinas illuminated quite well in the Summa. Trust isn't actually part of the principle as laid out by St. Thomas - and rightly so - because trust is a subjective element. St. Thomas dealt with what can be discerned in actuality. Is there a sin in the command. If not and the other conditions are met, True Obedience is submission to the lawful command of the superior. We also know that Bishop Williamson et al have set this principle aside. Their motivations? Fear, Conspiracy Theories and a trust in their own judgement over that of their superior(s). In the end, we now know that the Pope was not willing to accept the SSPX as we are. He required the complete acceptance of the Second Vatican Council and the New Mass etc. But up to that point, it was not clear. While Bishop Williamson et al would (obviously) disregard any alleged message from the Pope, is that really the line of Archbishop Lefebvre? Is that really the mark of a Catholic? A Catholic always responds to the call of Rome to do otherwise is to step off the path of Archbishop Lefebvre and onto the path to schism. A Catholic does not let his imaginary fears dissuade him from True Obedience. That is the Catholic way, that is the path that Archbishop Lefebvre followed. It is the path that the SSPX follows today. Note 1: I understand that some 'resistors' will present as proof to the contrary an article written by Bishop Tissier de Mallerais. I would suggest that they read the entire piece - Bishop TdM. 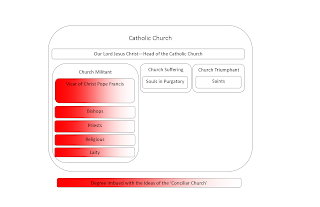 Firstly, the conciliar church is not materially separate from the Catholic Church. It does not exist independently from the Catholic Church. There is a distinction certainly between them, a formal one, without an absolute material distinction. So the model I present below is consistent with both the view of the SSPX and Bishpo TdM. Secondarily, as the SSPX in 1988 referred to the 'conciliar Church' as a spirit within the Church, anything deviating from this would by definition a departure. Hello, thank you Tradicat for your posts concerning the resistance. I've stopped going to forums and such because I realized that I was absorbing too many people's opinions and not enough Church teachings. Your blog posts have been a reason that I made that change. You actually post concise logical reasons why to stay away from the resistance, which I have never been a part of. I actually took your advice and read the Catechism of Trent's words about the Four Marks of the Church. And I realized that I had made some critical errors in my thinking about the crisis in the Church. I think every traditionalist needs to read these teachings about the Four Marks of the Church. So I am commenting to also encourage you to continue telling the truth. You have helped at least one soul. Thanks - you've made my day!